Mike McGuire passed away Wednesday, June 26, 2018, succumbing to a devastatingly rapid recurrence of a cancer previously briefly in remission. He was comfortable in the presence of Sandi and family at the Emerald Cottage, where he and Sandi were living after their home was lost in the Tubbs Fire last October. 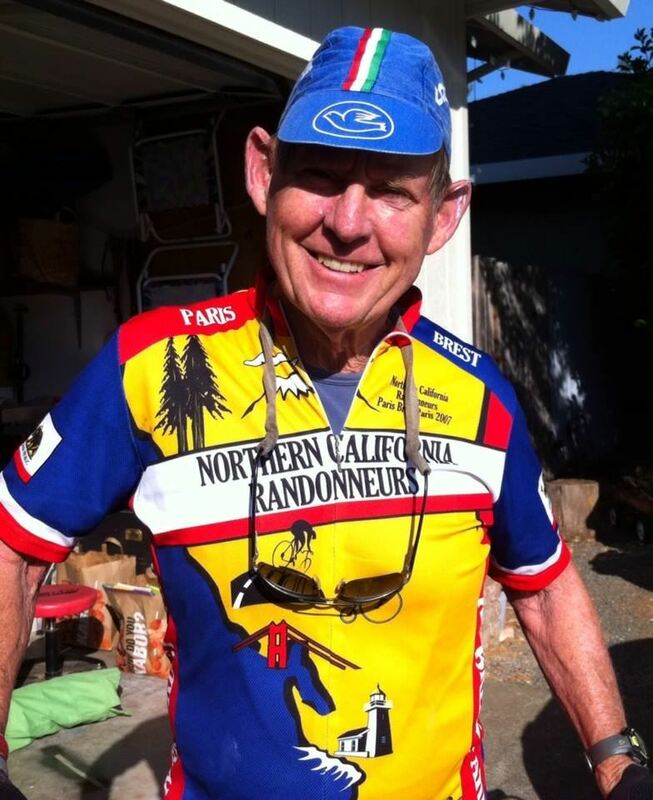 Mike had been a member of the Santa Rosa Cycling Club since July 2006. Mike, in his typical style, participated reliably, competently, enthusiastically and constructively and with abiding good humor and wit. 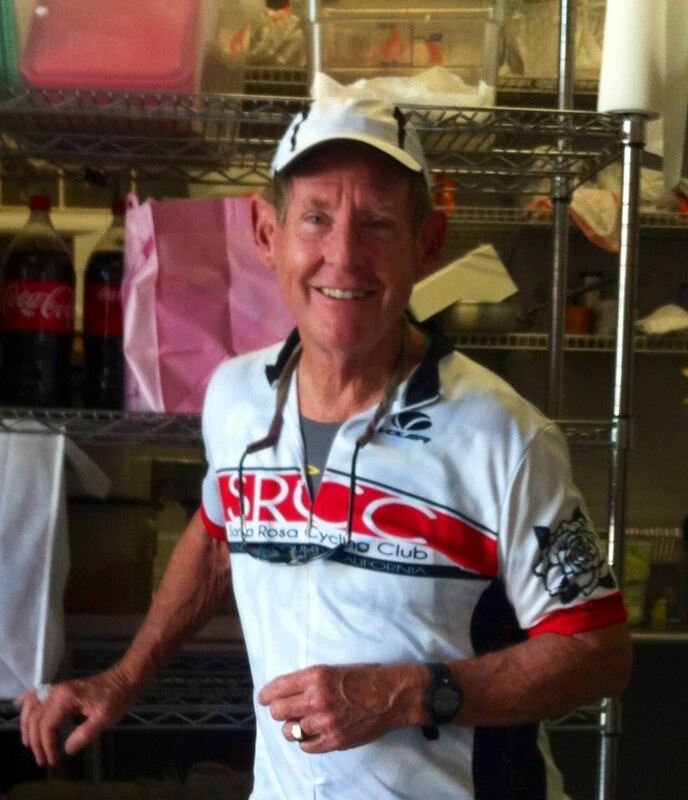 The list of his contributions and achievements is long: ride leader; multiyear WCC Monte Rio rest stop crew chief; club historian, two term Board member, instigator and lead in twice a year roadside clean up. Shortly after joining the Club, he completed the required brevet rides to qualify for and compete in the infamously grueling Paris-Brest-Paris ride, a 1200 km (750 mile) event to be completed in a maximum of 90 hours. His account of the experience can be found here (link to December 2007 SRCC Club Newsletter). 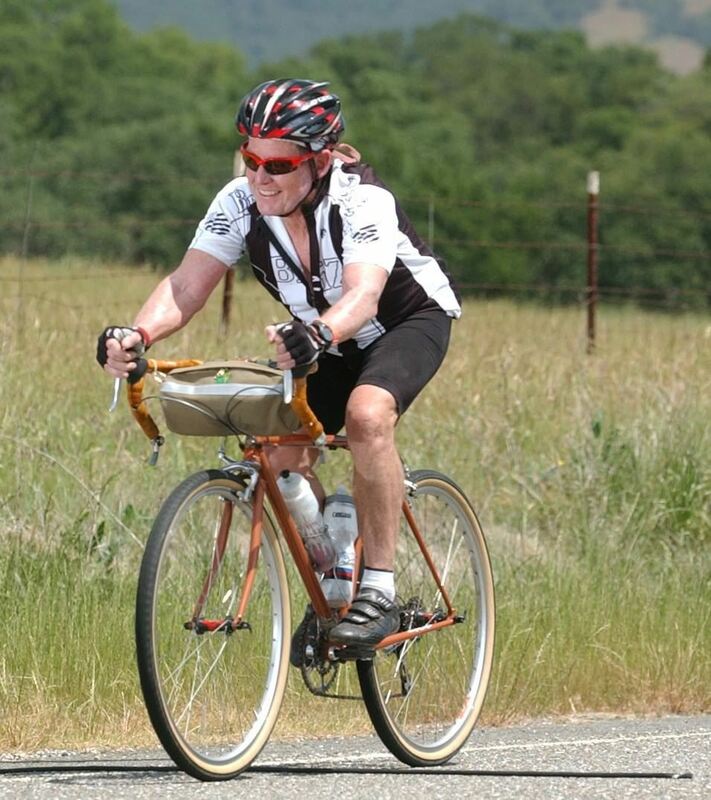 In addition to his cycling accomplishments, Mike was an avid runner and active member of the Empire Runners of Sonoma County, where he served as the club’s President and entered into its Hall of Fame. 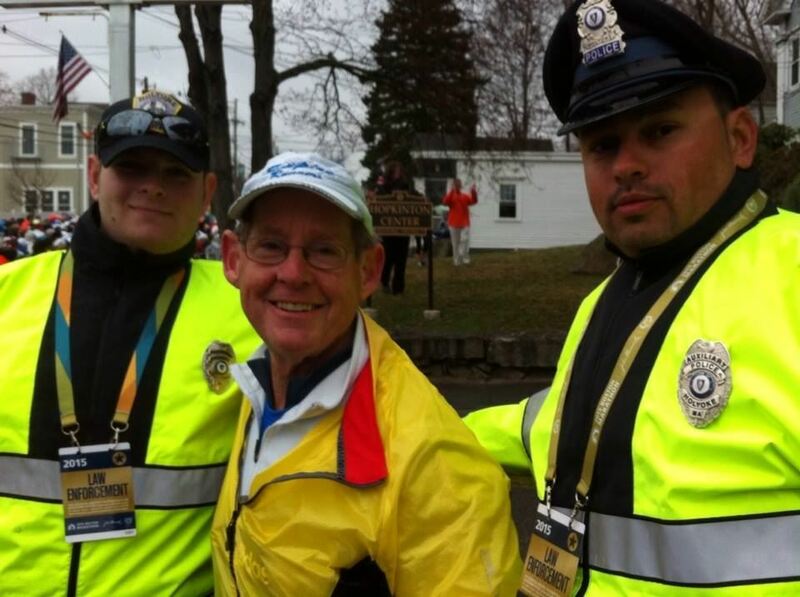 In 2015, at age 70, he qualified for the Boston Marathon and finished in a time that was the age graded equivalent of 3:02, which to quote Greg Durbin, who also ran that year, “an impressive achievement.” See HERE for a link to a tribute by Empire Runners. Mike was an educator by profession working initially as a teacher at Herbert Slater Middle School and later as Principal for Hidden Valley Elementary. He was extremely well suited for the profession. Mike was endlessly curious with a sharp, quickly analytic mind and broad ranging interests. He had strong sense of history. He was a talented photographer, an effective writer and a skilled and engaging raconteur. Mike emanated good humor and positive energy. Consistently civil and respectful, he was nevertheless candid and forthright of his observations and opinions. I remember the first ride I was on that he led, his concluding admonishment at his pre-ride briefing: “Don’t do anything stupid”, an admonishment I have frequently repeated, with attribution. I had gotten to know better Mike over the past couple of years. We swapped buying beers at Club meetings. We enjoyed conversations about books we’d read, our families, children and grandchildren. As the disease took firmer hold I visited him frequently at the hospital and later at home. Even then, when I saw him last, just a week before he died, the sparkle was in his eye and his trademark smile was on his lips. I believe I speak for those who knew him; many probably better than I did, when I say that he leaves behind people who held him in great esteem and abiding affection. He was a positive force. He approached his end with great dignity and courage. He will be very much missed. Our thoughts go out to his wife, Sandi, his daughter, Molly and son Sean, his brother and his grandchildren. I want to thank others who have expressed their thoughts about Mike, and from whose comments I have borrowed freely: Karen Thompson, Doug Simon, Greg Durbin (especially for details on PBP), Liz Sinna and others, including Larry Meredith of the Empire Runners. The family has announced a memorial service for Mike at 1:00 PM Sunday, August 5, 2018 at Daniel’s Chapel of the Roses, 1225 Sonoma Avenue, Santa Rosa. The service will be followed by a reception at the Friedman Center 4676 Mayette Ave. Santa Rosa. His obituary can be found HERE. Note: SRCC is planning a memorial ride in honor of Mike. Details will be announced soon. The wooden “A” frame sign building project is done. Many Many Many determined hands made for the completion of the huge project, ahead of schedule!! Many Many Many THANK YOU’s to all that lent a hand, an amazing amount of positive energy. I KNOW I MISSED A FEW OTHERS, SORRY, IF YOU HELPED ON THE SIGN PROJECT AND I DID NOT INCLUDE YOUR NAME, PLEASE LET US KNOW, WE WANT TO GET IT CORRECTED!! Sunday, April 8th (9-noon): a small project, – Watch you inbox for details..
Sunday, April 22, (9 to 3): Washing (sanitizing) all the new ice chests and drink jugs, huge project, we will need many many hands…. Mark you calendar… details to follow…..
As you all likely know by now, the Club’s warehouse was burnt to the ground, by the fires that have devastated our county and our city. Of course, you are the real heart and soul of our Club, but the warehouse was the core of our operations. The equipment and material stored there was key in providing support for the Wine Country Century, the Terrible Two, Levi’s GranFondo, our own Club Tours, and many other cycling events in Sonoma County. Our loss is estimated to be from $100k to $150k. That sum is only surpassed by the thousands of volunteer hours that have been invested over the years. The Club did not carry insurance on the contents. This was clearly a mistake that we cannot fix. However, as we work to rebuild, I can assure you it will not be a mistake that we make again. Which brings me to the next subject: the future. Three cycling clubs in neighboring counties have made contacted me with offers of support and assistance. The Sonoma County Bicycle Coalition is having a fundraising event this Saturday, October 28 (Bikes, Blues, and Brews), with a portion of the proceeds for our relief. Local bike shops have asked me what they can do to help us recover, as well as a cycling tour company. Many of you have offered to help. Our landlord has told us he intends to rebuild and would like us back as a tenant. With all this outpouring of support, we will recover. In the short term, a group met last week to discuss our options and it was decided that we are going to hold the Wine County Century and The Terrible Two in 2018. We had lots of ideas about how to make this happen. After all, the Club has been running these events since long before we had a warehouse. The WCC and Warehouse Committees will be meeting to sort out all the details. Lead a ride! There are many openings on weekends and weekdays (some of our leaders lost their homes). If you cannot lead, call someone and ask them to lead. Weekend or weekday, but especially weekends, we need ride leaders. All paces, any distance. Volunteer! Sign-up for a volunteer position when we post them on our website, or announced in the weekly e-blasts. The sooner our committees get people signed up, the better. Come to our General Meetings! I’ll be there to answer questions and provide updates on our progress. Get to know your club while off the bike! Finally, several of you have asked what you can do to help and some have offered up ideas. We welcome your input and help as we move forward. Working together, I am confident that our Club will recover and thrive in the future.